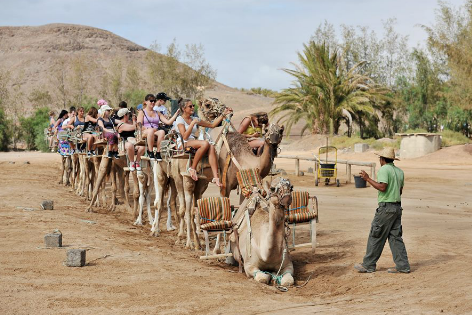 Enjoy special attractions and experiences only at Oasis Park Fuerteventura. 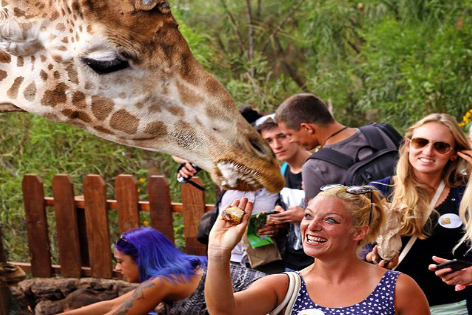 Animals in their habitat, largest camel reserve in Europe, shows full of entertainment and more. Book tickets for family and friends for lots of fun. Oasis Park Fuerteventura started in 1985 as an ornamental plant nursery with species from around the world. It has the largest camel reserve in Europe. Their pioneering project: the production and future marketing of camel milk. There are also camel safaris and many more attractions you can enjoy here. The flora and fauna of the island is recreated and over 3000 animals and 250 different species live here. This place is a must visit in Fuerteventura. Oasis Park runs popular shows like the new the Fauna Live, the Sealion Live, Live Birds of Prey Show and the Parrots Live show. It is an outdoor space with all kinds of reptiles and the animals portrayed on the small and the big screen. Learn about the history of our friends with dry and hard skin, crocodiles; and not lose sight of our display with more exotic lizards or snakes. Fear not, they are very close to you, but they can not reach you! The space includes a palm garden, an impressive large sunken rescued boat and a beautiful ocean view. Watch the live sealion show, admire the four lovely and intelligent sealions, Nando, Ivonne, Lisa and Lobos who will amaze you with their acts like jumping out of the water to the rhythm of dancing music and much more. At the Birds of Prey Show, the birds will fascinate you with their manoeuvres in the sky or skimming the ground, feeling the breeze as they take off. Hawks, vultures, eagle owls, barn owls, eagles will display their a series of aerial exercises that will leave you completely spellbound. At the Live Parrot Show discover the magic tricks of the most exotic birds: the parrots, who will host a fun show. 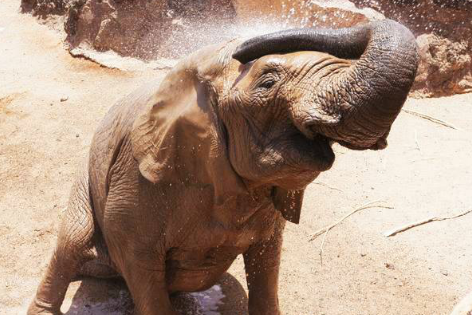 Enjoy an adventure with these beautiful creatures. A performance packed with trials and obstacles. Skating, riding scooters, playing basketball or sunbathing; our birds display their amazing skills. Furthermore, by using colours and shapes, they will display their intelligence by linking ideas, as mentioned above, in especially prepared games. 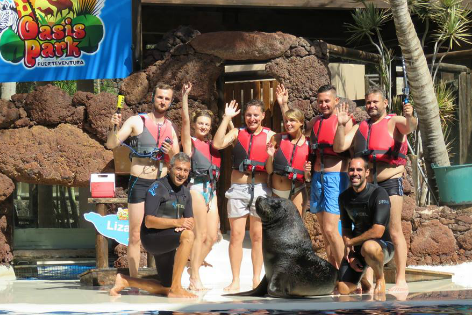 At the Oasis Park Fuerteventura become the special guest of our sea lions for 20 minutes; a period of time in which you will be able to feel their fur and breath, touch them and feel them in the water and on land. Have a marvellous encounter with curious Lemurs from Madagascar. They will try to communicate with you by sounds, sight and smell and you will have to be alert. You can observe and interact with the lemurs, allowing them to go where they like. Enjoy Camel safari where you embark on an adventure trip to the unknown, inside and outside the zoo. Take a short route or take a longer trip to the top of the mountain, from where you can enjoy views of the horizon or the Botanical garden of our paradise. A truly amazing experience. The Kid’s Farm will immerse children in a natural environment. Meet goats, cows, ponies, emus, horses, tortoises, ducks, guinea pigs and rabbits. Nearby the kid’s park ensures that our tireless adventurers will be able to enjoy themselves. There are a wide range of swings and a sand pit that will enable them to extend their adventure without holding on to mum and dad, who watch from a short distance as they play. Kids will have a great time in the play area, imagining new adventures with their friends. There are swings, slides, tunnels, trampolines and lots more. At Fuerteventura Oasis Park, different types of therapies have been devised to help improve the condition of people suffering some type of illness or disability. They are committed to improve health through therapies which include fun interactions with our sea lions colony and Madagascar Lemurs. Restaurants: You have choice to eat at three restaurants, Oasis Restaurant, Sea Lion Restaurant and El Patio Majorero Restaurant. Wheelchairs: The park also provides renting electric wheelchairs for less abled customers. Jungle Bus: The Jungle Bus is a completely free service that transfers visitors from an area close by the Sea Lion Show to the largest Botanical Gardens in the Canary Islands. Shops: There are two shops in the park, the Oasis Shop and the Sabana Shop. Nappy Changers: With a view to catering for the needs of your younger children, all ladies’ toilets in the Oasis Park Zoo have nappy changers. Scooters for rent: A new and comfortable way of visiting Oasis Park Fuerteventura is on a scooter. Enjoy a ride on electric scooters around the park or to the Botanical Gardens. Highly advisable for people with mobility issues. Bicycle Parking: There is an area at the entrance of the zoo where visitors may park their bicycles for free. Oasis Park Fuerteventura is a star excursion and comes highly recommended, especially with kids. A guaranteed chilled out day. 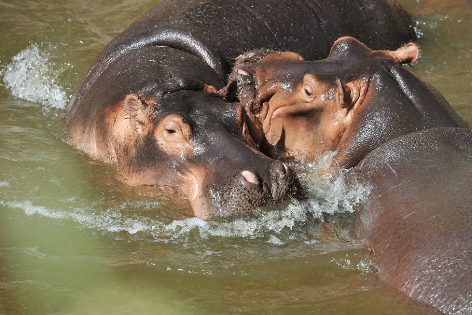 Being at Oasis Park has to be one of your best days out and highlights of your holiday! Definitely the best things to do in Fuerteventura for all ages.